My musical colleague, dear friend and harpist from Brétagne Célestine Doedens is coming to give some gigs with me in the Czech Republic at the beginning of December! Together we are called Deliou, which means Leaves in the language of Bretagne, the language that she can speak fluently. She comes from the area of Bretagne where the breton poet Angela Duval was born. We met 4 years ago in Prague and since the moment we have been enjoying the precious moments playing the harp, violin and hardingfele together, travelling and giving concerts all around Europe. We have recorded a CD called Mezi listy (Among leaves). We have also created an audiovisual project, a performance called ” Les Plantes Vivantes ” – Living Plants. We are giving three concerts. The first one will be on 1st Dec in the intimate atmosphere with candles of Salla Terrena in the mystic heart of Prague in Kampa. The second one is going to take place in an old tower ! In the town of Mělník in the wine area north of Prague. 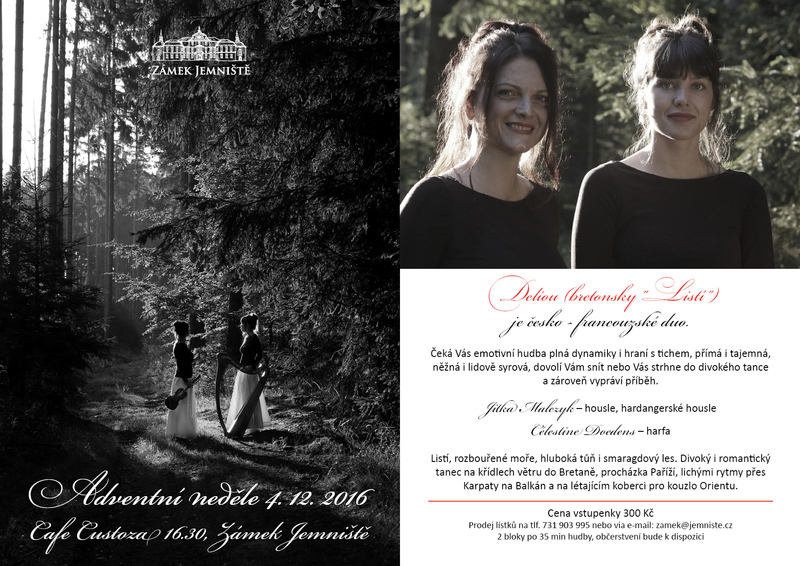 The third one is going to take place in the baroque chateau of Jemniště east of Prague.